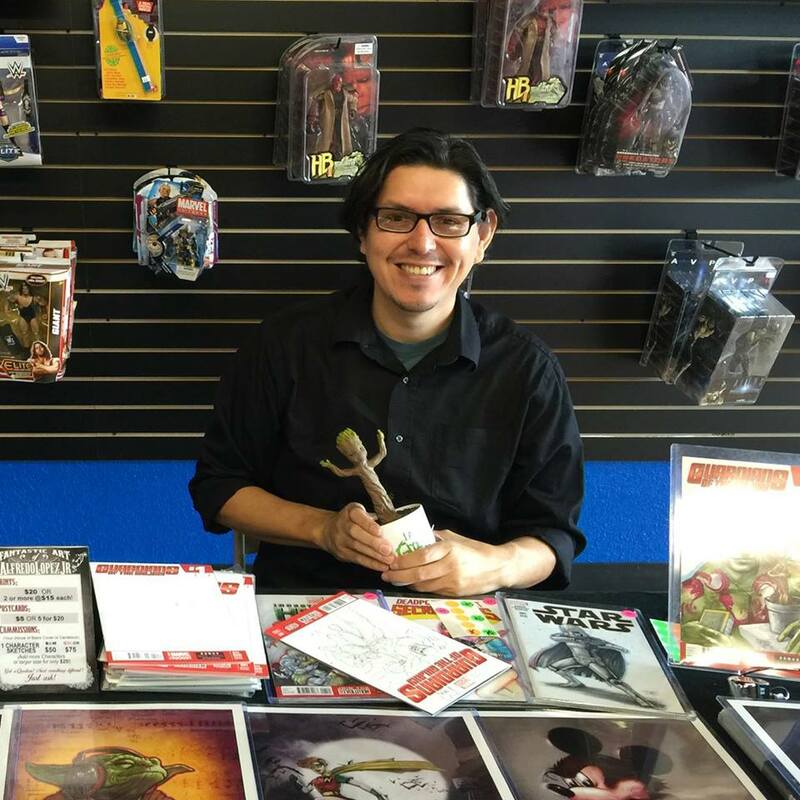 Speculative San Antonio: Artist Alfredo Lopez Jr.
Freddy Lopez has been a ubiquitous presence at San Antonio conventions, film festivals and comic shops. Today marks the launch of a new feature on my blog, Speculative San Antonio, in which I highlight a South Texas creator of science fiction, fantasy or horror literature, film or art. My first real interaction with artist Alfredo ”Freddy” Lopez Jr. came more than a year ago when he illustrated the front cover of my novel Deadly Passage and that of Dog Days, the Joe McKinney novel it was published back-to-back with. Freddy turned the covers around fast, working closely with myself, Joe and our publisher to accommodate a myriad of suggestions. He was an enthusiastic, patient collaborator and one I’d work with again in a heartbeat. The covers still gets numerous compliments. Based on that experience, it comes as no surprise that Freddy has emerged as a go-to talent for comic cover art, concept, game and sketch card work. He’s collaborated with some of the top names in comics as a colorist, and he recently launched a Patreon page to free himself to pursue more work outside of comics. Freddy’s work is recognizable for its vibrant, painterly use of color and for its clever humor. He’s a fan of mash-ups, frequently juxtaposing characters from different comic and movie franchises. A Freddy Lopez illustration for an RPG rulebook. Freddy: Yeah it’s a shift that I’ve been talking about for a while but finally putting into action. When I was younger, my goal was to be a fantasy artist along the lines of Boris, Elmore, Bernie Wrightson, Frazetta, the Brothers Hildebrandt, etc. I dreamt of being a book illustrator like other kids dreamt of being athletes. I promised myself when I grew up, I’d be the next Frazetta. Of course, like every kid, I also grew up on superheros. So along with my drawings of knights and dragons, I had drawings of Batman and Superman. As i grew older, I met more friends with similar goals. At the risk of sounding old, the internet was evolving as I was entering the scene and gave me a new way to get in contact with creative people all over. Forums and online portfolio sites helped get my work out and eventually, as friends broke into the business, they were kind enough to contact me and ask if I’d like to help. So that’s what got me into comic work. Friends like Nate Piekos, Chris Mills, Howard Wong and others really helped open doors for me. My first love was still illustration work, though, and I found what I enjoyed most was doing illustration style comic work like covers, pinups, coloring and painting. I soon discovered trading card work, which helps satisfy that aspect for me. Now I’ve had the chance to work for some of my fave companies and properties like Upper Deck, Walking Dead and Marvel Comics , where I’ve been part of the team of artists doing cards for Ant-Man, Avengers Age of Ultron, Guardians of the Galaxy and others. Over time, I’ve also been getting back into more traditional illustration projects by doing work for books and games. I’ve had the opportunity to work with a couple of amazingly talented local authors doing covers for them. I’ve also been getting more work in RPG games and event posters. 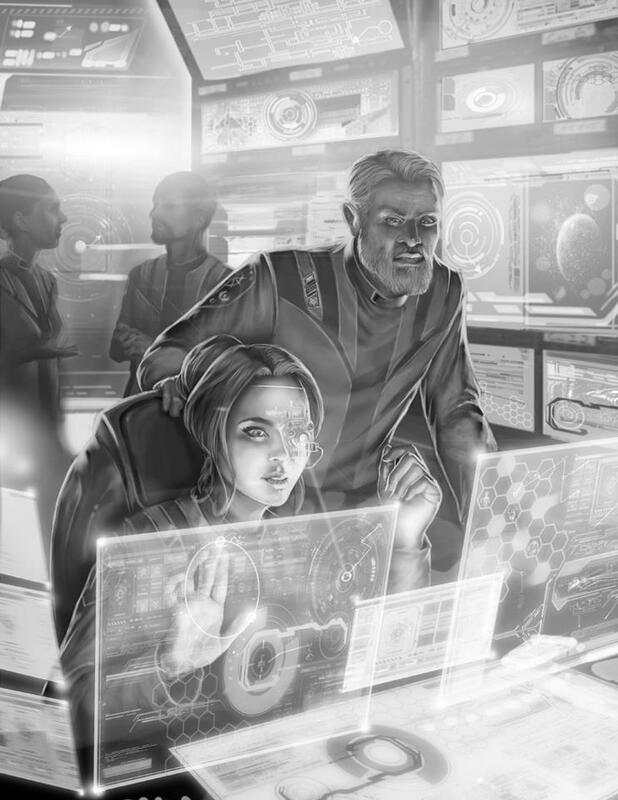 The concept art is tied to the RPG projects in fantasy and sci-fi. Aside from cover and spot illustrations, I’ve had the chance to work with some great art directors on concept pieces. The general difference is that while illustrations are final pieces that are used in print, concept is usually higher level work used to get the basic ideas or concepts of a project down. It helps establish color palettes, mood and tone or the design of characters, creatures, ships and environments. Part of this move to illustration has also included doing more prints for convention signings and appearances. I’ve built up a porfolio of convention poster/exclusives for a wide range of celebrity guests and appearances that have included Gunnar Hansen (Leatherface), Ricou Browning (Creature from the Black Lagoon), Michael Rooker and both Boba Fetts, Jeremy Bulloch and Daniel Logan. Most recently I did the signing for Dave Bautista (Guardians of the Galaxy’s Drax) for a new comic store, Alamo City Comics. I even did the poster for the upcoming Horrific Film Fest, which includes celebs such as Elvira, the cast from The Warriors and Buck Rogers. 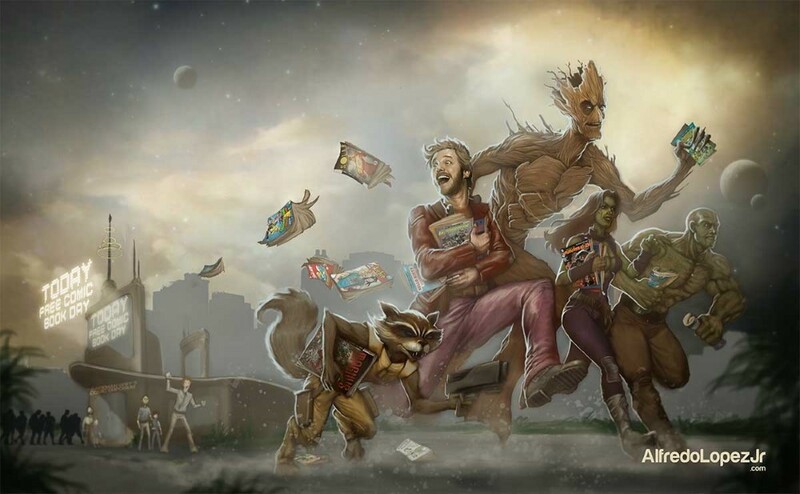 Freddy Lopez's "Guardians on the Run"
The Patreon page is a new concept for me but sounded like a fun way to reach out to fans and reward backers with behind-the-scenes items (tutorials and source files) as well as helping me to stay on track as I make the transition. You’re a ubiquitous presence around the Alamo City. Seems like I see your table at nearly every convention, film festival and pop-culture art show I attend. How do you juggle all of those appearances with your creative time and a day job? Freddy: LOL. It’s not easy. Last year I did as many as I could. There are new ones poppigng up all the time, and keeping up was more work than I expected. This year, not so much. For most shows, I would prepare for a week or more in advance then spend another week or two catching up and transitioning to the next one. I became part of the “con-artist” crowd and realized that scene just wasn’t for me. I would rather spend my time working on an illustration for a client than a print for the next show. I’ve cut back quite a bit and for the first time in MANY years i’m able to visit a few cons as a fan and not just an artist. Plus, I can feel the quality of my art improving now that I’ve shifted gears a bit . Freddy Lopez's "Han Trejo and the Chewbaccabra"
You seem to enjoy mashups in your work, combining characters from different comic, movie and TV franchises with often humorous results. Talk about how that originated and what it fulfills for you. Freddy: I do! I will always have a love of mashups. I love trying to find a spin on something that makes a bit of a comment on the characters used and also says a bit about my sense of humor and interests. For example, a few years ago we did a Star Wars themed live art event. I wanted to do something funny with a bit of a Latino twist and came up with a Chupacabra/Chewbacca mashup — and who better in the BA Han Solo role than Danny Trejo? 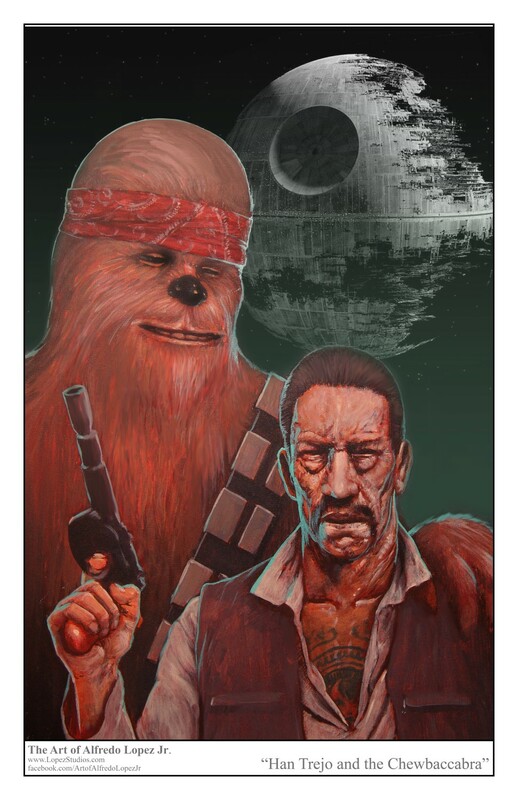 So the idea for the “Han Trejo and the Chewbacabra” piece was born! The Logan mouse piece was done way back when Disney bought Marvel and seems to have struck a chord with the community. More recently, for the Bautista signing, the store had the idea to mash up bautista’s Drax character with his Wrestling past, and both Bautista and the fans seem to have really enjoyed it. You’ve also done work as a colorist for some big names in the comics business. For the benefit of those of us outside the industry, how does that collaborative process work? Freddy: That was a lot of fun and definitely opened some doors for me. Like I said, my fave part of the comics process is the illustration part. I especially love experimenting with digital painting. So, when friends got breaks in the industry I was fortunate enough to have them ask if I could join their team and color their work. In comics, there’s usually several people that put it all together. For the story there’s the writer and editor. On the art side, there’s a penciller (who sketches out the page), an inker (who draws and tightens up the page in traditional or digital inks) and a colorist (who takes the line art and then colors it in digitally). I’ve recieved a lot of comments on how my coloring style was different from the traditional comic looks, so I always brought that to the table. Over the years, I’ve had the chance to be a colorist for projects that include Howard Wong (After the Cape/Image Comics), the legendary Joe Staton and Chris Mills (Femme Noir/Ape Entertainment), Dave Myers, Stephen Lindsey, Nate Piekos (Blambot/Atland), Dwight MacPherson (Morbid Milton) Chris Dibari (Starship Troopers) and many others. Your work cuts across a lot of genres. 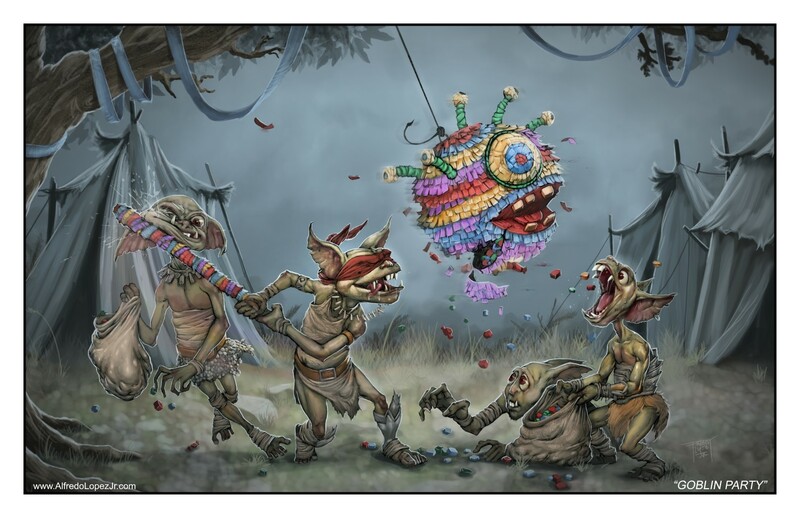 It seems like you tackle superhero, science fiction, fantasy and horror art with equal aplomb. Which of those genres do you spend the most time with as a fan? Freddy: Well, I’m a huge fan of them all. I read a few comics when I can but my fave genres are definitely horror and fantasy. I play D&D with a group of friends and collect books on fantasy art. I love watching and reading horror, and I get excited any time I get an opportunity to work in those fields. What’s next for Freddy Lopez Jr? Any new projects on the horizon you’d like to tout? Freddy: Definitely! I’ve got a few projects in various stages of developemment. I just wrapped up some illustration work for the Shadowfist Collectible Card Game by Inner Kingdom Games. This is the 3rd set I’ve done for them and can’t wait to share them with everyone. I’ve also worked with author John Kadolph on his Pathfinder-compatible gaming supplement at Starhawk Fantasy Publishing, which is set to be released soon. I’m also working on an event poster for Monster Con and their guests, headlined by Ken Sagoes (A Nightmare on Elm Street 3: Dream Warriors). I’m also working to have stuff ready for the premiere of GameXpo here in San Antonio later this month. I’m excited about that, because it’s a local con with an emphasis on gaming and fantasy. Should be fun! On the comic front, I’m still working on card sets for Marvel and Upper Deck. My contributions to the Ant-Man set, Firefly set and Upper Deck’s award winning Dinosaurs card set should be hitting soon. And there’s more to come in the fall. I’ve got a couple of projects in the works with local comic shops that I hope to share soon. Oh, I’ll also be giving a short presentation to kids (and adults) on Aug. 29 at the Forest Hills Library as part of the San Antonio Public Library’s Illustrator Series. There, I’ll be going a bit more in depth about my work and what it’s like to be an illustrator. I also tend to stay pretty busy with commission works. I do a lot of sketch covers and cards for fans. Sketch covers are blank variants of comics made to be drawn on. This concept has become a pretty big hit, and I get a lot of people ordering commissioned art as gifts. Commissions range from people wanting their kids drawn as superheroes on a blank Avengers cover to wanting loved ones as zombies on the cover of a walking dead comic — and everything in between. So, with those projects, the day job, family and friends, my plate stays pretty full. When I do have free time, I find myself working on more fantasy pieces and submitting to publishers to help keep that promise I made to my younger self. This entry was posted in Art, Speculative San Antonio and tagged Alamo City Comics, Alfredo Lopez Jr., Ant Man, Avengers, Bernie Wrightson, Boris, Chris Dibari, Chris Mills, Comic books, Danny Trejo, Dwight MacPherson, Fantasy art, Frank Frazetta, Freddy Lopez, GameXpo, Gaming, Guardians of the Galaxy, Horrific Film Fest, Howard Wong, Inner Kingdom Games, joe mckinney, Joe Straton, Marvel Comics, Monster Con, Nate Piekos, San Antonio Public Library, Star Wars, Starhawk Fantasy Publishing, Upper Deck, Walking Dead by sanford. Bookmark the permalink.